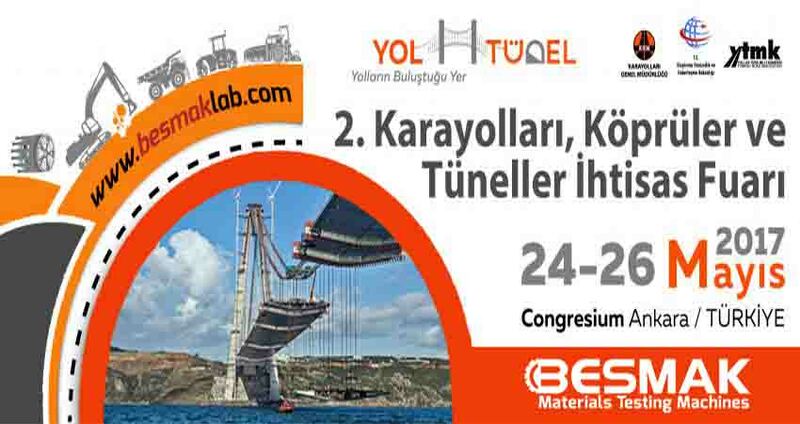 BESMAK Materials Testing Machines is one of the participants of the Road Tunnel Fair which is organized by Republic of Turkey Ministry of Transport, Maritime Affairs and Communications and the Republic of Turkey General Directorate of Highways and the Turkish Road Association with the motto which is "The place where the roads meet". The motto of the Road Tunnel Fair which will take place in Turkey, which is located on the most important way of connecting Asia to Europe, was determined as "The Place Where the Roads Meet", which describes the most appropriate way. At the same time, Ankara which is capital city of Turkey, is located at a central point in the country and connected to each other through many city roads, bridges and tunnels. The fair, which is literally "The place where the roads meet" and which will be organized in Ankara while covering all the points of service will host a major and important event hosted by public institutions and organizations, universities, contractors, subcontractors, machinery, material and equipment providers and national and international companies. We are honor with visiting of the Turkey government agency at our stand which is B-11B at the Congresium Exhibition Center on 24th – 26th May in Ankara.